Did Frank Sinatra record the first concept album? A concept album is a collection of songs are linked by a theme. It is generally associated with artists like The Beatles (Sergeant Pepper, Magical Mystery Tour) and later David Bowie (Ziggy Stardust), Pink Floyd (Dark Side of the Moon) and countless others. But the real pioneer was not a 60s hipster but a star from the fuddy-duddy1940s, Frank Sinatra. What was the first concept album? In 1954 Sinatra began working on a collection of songs inspired by his recent break-up with Ava Gardner. 'I want to make an album where all the songs link together,' he told his record company, Capitol Records. 'The theme will be lost love'. How did Sinatra persuade them? But Sinatra was convinced his 'concept' could work, and began working with the great arranger Nelson Riddle. He then flew the entire senior staff at Capitol Records to a special performance of the new collection of 'heartbreak' songs, In the Wee Small Hours of the Morning. The skeptical executives were suitably mesmerised - and gave the album the go-ahead. 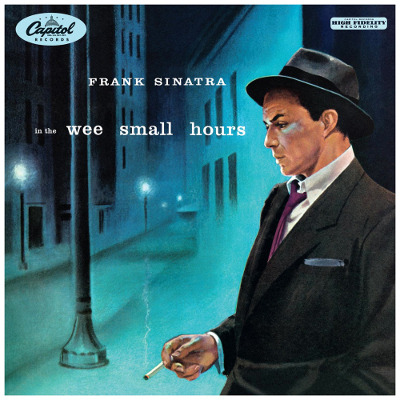 Sinatra's judgement was further vindicated in 2003 when In the Wee Small Hours ranked 100 in Rolling Stone Magazine's list of the 500 greatest albums of all time.